UNITED KINGDOM VENDING MACHINE COMPANIES! These UK Vending Companies may offer: Snack, Soda, Drinks, Food, Deli, Coffee, Healthy vending machines, Micro Markets, Amusement Games, Machine Repair & Refreshment services for your breakrooms! Please contact these vending companies direct for more information about their vending services & products they offer. Bean Doctor Ltd – Specializing in the repair of Commercial and Domestic coffee brewing machines. Coffee Machine Repair Specialist! Have you bought a machine off e-bay or inherited one with your business and have no idea how to get it repaired? Are you a machine supplier with no reliable service back up, or perhaps just need specialist knowledge to supplement your service team then Beandoctor could help, our company is based in United Kingdom. Bordericks Love Coffee – UK Call sales on 0844 335 3000 to talk to one of the nations largest providers of healthy refreshment services. Founded by John Broderick senior in 1969 Broderick’s Coffee was created to provide refreshment services to commerce and Industry. We invite you to taste premium healthy refreshment services brand “Broderick’s Love Coffee”. Here at Deluxe Drinks, we have an amazing range of new and refurbished water coolers, snack dispensers and coffee machines to suit your every need! From luxury coffee machines to snack dispensers, we have a great variety available with low pricing options including weekly payments. Some of the machines even pay for themselves! We offer a range of repair and service options for your current machines! Find out about our great range of deals today! We are available to deliver in and around the Essex area, so get in touch to find out more about delivery options or see our website! We are proud to boast being one of the top vending companies based in Essex. We have been trading for over 20 years and are experts in the vending industry. Express Vending UK– Providing vending machine solutions to offices and work places since 1992! Snacks, Sweets, Hot Drinks, Food Vending, Name Brand Products for your place of business! Coffee Machines -We provide Kenco singles coffee machine, cheap coffee vending machines, automatic coffee machines in UK, buy Coffee Machines online or make a call for delivery to your business. Maix Vending Limited – aims to provide its Customers with a first class service for delivery of supplies of vending Equipment, Beverages and Ancillary items. Covering: All of South Wales, Birmingham, Herefordshire, Powys, Worcestershire and the majority of the West Midlands areas. As Vending Machine Suppliers, Premier Vend Ltd is committed to providing a flexible and responsive service to the customers. We ensure that the product we offer is of the highest quality. We also try our best to keep improvising in order to keep environment impact to the minimum. We cover a range of vending machines. Whether it is hot drinks, coffee, cold drinks, snacks; you name it and we have it. So for any vending machine requirement, do not look further. We are right here to serve you. Contact us at 01244 638084. Refresh Vending in UK– Regular and easy access to our operations team is a basic requirement of all of our customers, but it is amazing how many of our competitors neglect this. A Refresh Vending contact is always at hand for a swift response to any request, and you won’t have to jump through hoops to get to them. 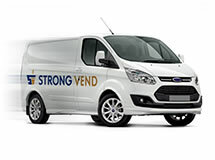 Strong Vend Limited – Strong Vend is an independent company providing refreshment services to commerce and industry across the London region since 1980. Our base in London’s Docklands provides excellent access to customers in Greater London, England.